The people of Touma community, Bille kingdom in Degema Local Government of Rivers State have accused soldiers of invading their community. They alleged that 15 houses were torched and many were injured. 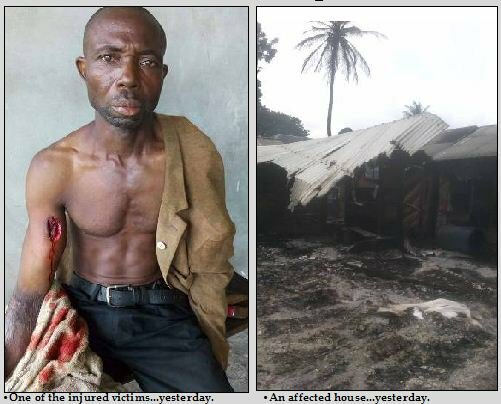 An eyewitness, Mr. Akpoebi Dino, said unidentified gunmen attacked an Army House Boat at Touma last week, killing two civilians and a soldier. The source said men of the Joint Military Task Force stormed the area in over seven gunboats and shot people. He said: “The soldiers, on reprisal, came to our community in over seven gunboats, shooting sporadically. “The incident occurred, about 10 a.m., Many people were injured and 15 houses burnt down. “The soldiers accused us of conniving with criminals to attack them. We don’t know what they mean by that. Bille kingdom described as shocking, the attack on Touma by military men, saying the reprisal was unwarranted. In a statement signed by the Chairman, Bille Kingdom Community Development Committee, Asatubo Igbanibo Kemuel and the Youth President, Obirabi Sanipe Sylvanus, the kingdom noted that Touma was invaded by military men. The statement reads: “Soldiers, who came in about seven gunboats and eight speed boats, attacked Touma. They torched houses and destroyed property. “Residents fled. Many people are still missing. Mr. Profit Joseph, a resident, sustained bullet injuries. “Touma people will never attack soldiers and security personnel. We condemn this attack, maltreatment of innocent civilians and destruction of property. The Nation to the Joint Task Force (JTF) acting PRO, who he said is in a position to speak. The Acting PRO, Lt. Commander Otuji, refused to comment. Police spokesman Nnamdi Omoni promised to contact the District Police Officer at Bille. But he later said he was occupied with the visit of Acting President Yemi Osinbajo.